If you were here in my house, the only sounds you'd hear would be the click of my keyboard, the hum, of my CPU, and occasionally, the heat coming on. That's because it's Friday night and it's my quiet time. Yes, it's true, I get a few moments of quiet time on Friday nights. How? Why you ask? Can it be true? Yes, it is amazing, and true. Meg plays hockey on Friday nights, and I do not attend. Doug takes Drew with him, the twins go to bed, and I get some much needed downtime. When Meg started hockey back in October, I did try to attend on Friday nights, and it became a strategic nightmare. So, I opted out of going on Friday nights, and have since enjoyed the bits of quiet. Sometimes I watch tv, other times I clean up, and there are some times where I have to get ready for a scrapbooking workshop. Tonight is not any of those nights. Well, that's not true. I'll probably clean up the living room and put away all the puzzles that fell over. But I'm tired and just want a break. So, today I was playing cars with Drew and he showed me how amazingly observant he is. 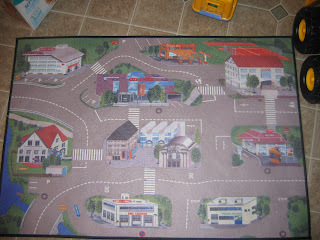 He has a playmat that shows a little city on and we were putting the firetrucks at the firestation, cars at the house (which he told me is our babysitter's house) and then I sent a car to the drivethru at the McDonald's-type place on the mat. He took the car from me, backed it up into a parking spot and said "Mommy, there are no babies in that car. They can go inside to get their food". I laughed right out loud, because he is well aware that if I want a coffee or to go to the bank, I have to use the drivethru. When Doug takes him out, they can actually GO INSIDE! I must say he is a very smart little 3 year old. Well, the serenity of my evening has been interrupted by the ear-splitting screams of Annie, so I must check on her.